KAPPETS are comprised of a #8 screws and caps. Screws are zinc plated steel with AB machine thread, self tapping with Phillips drive and have a special head design so the caps can "snap" on. 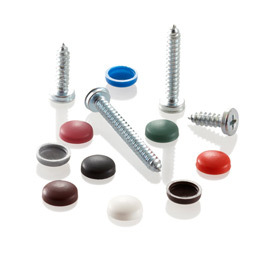 Screws are #8 size in lengths of 1/2", 5/8", 3/4", 1", 1-1/4" and 1-1/2". Caps available in 34 standard colors.